For a lovely appetizer, or even a whole meal, this simple dish is quick to make, and big on taste. 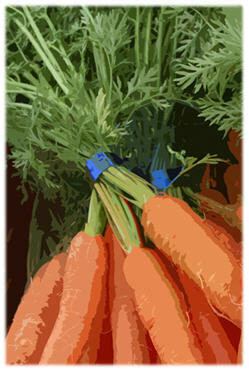 We often gobble up a plate of these carrots for lunch or a snack. It's fun to eat this Vitamin A and calcium rich, good-for-the-eyes food, along with the pungent, pale gold, curry sauce. Dip the carrots by hand into the sauce for a surprising treat! Rinse carrots. Scrub or peel if necessary. Cut off any green color at top. Slice diagonally, making the cut as angled as possible, to create a large dipping space. Put carrots into a bowl. Pour oil on carrots. Mixing by hand to evenly coat. Place carrots on a plate. Sprinkle sesame seeds on top, along with a little freshly ground salt. This sauce is also delicious over greens, or tomatoes. If you're watching fats, delete this part of the recipe, and sprinkle curry powder on the carrots. 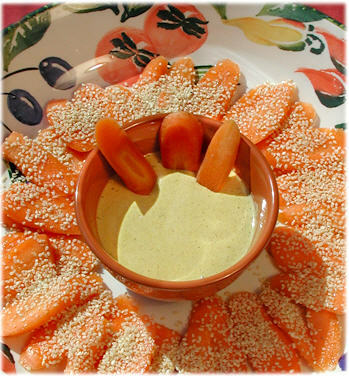 Dip carrots into sauce. Enjoy! We have learned that health modalities such as whole foods, homeopathy, flower essences, practicing mindfulness, daily heart contemplations, chanting holy words, exercising, being in nature—all resonate with, and help to purify our auric field. We were excited to learn what Dr. Gabriel Cousens writes of in Spiritual Nutrition and The Rainbow Diet, about color, vibrations and chakras. "The vibrations of food are first absorbed visually. The color and arrangement of food creates a certain mental and physiological readiness." Through extensive research with special diagnostic instruments, he discovered that: "Each food according to its outer color, which is its reflecting surface, can be related to the specific color and energy of a particular chakra. Each colored food energizes, cleanses, builds, heals, and rebalances the glands, organs, and nerve centers associated with its color-related chakra." He thinks of living foods as "condensed colored sunlight." Orange is the color of our 2nd chakra which governs creativity, fertility, and more. Maybe this is why orange juice is one of the most commonly consumed beverages! Looking at the old bugaboo, inertia, we have often wondered why, when beginning a new regimen, we'd suddenly hit the wall. We craved certain foods, caved in with our resolve, stopped exercising, had a healing crisis, got reactive, depressed, lost interest, or any number of things! We wondered, why? I began to suspect that it was because a negative life-form (whether physical, emotional, or mental) that had it's existence within us was being challenged, threatened. The life-form had quite a vested interest in maintaining the status quo. Major changes would make it disappear—in effect, die. It didn't want that to happen and it was going to hold on, kick and scream, really make a scene. So the only thing it could do was tell us in a very loud and clear voice that it wanted—no—it really, really, needed, that second piece of chocolate cake, or huge plate of fries—and to certainly forget all that spiritual, or health food, stuff. Keep things the way they've been, it cried. No change is good—but inertia, complacency, procrastination, would do wonders for maintaining its life. After all, this was how it would keep it's strength up! The same holds true for loving practices—the body, mind, and spirit begin to ask for more of these as we replace old patterns for newer ones that serve our lives in a greater way. It may seem like a small change, eating carrots with sesame seeds for lunch, but the stimulating colors resonating with the creative chakra, the beta carotene in the carrots—so good for our health, and the calcium rich dipping sauce, just might stimulate creativity and help with overcoming inertia. At the very least, these foods taste delicious! While we're munching away, we're unfolding into a new consciousness, manifesting our dreams through creativity that embraces change, stimulates vibrant health, and enhances spiritual wisdom!